Let’s cut right to the chase… After 7 years of wireless lighting control over Wi-Fi connections, we’re excited to announce that Luminair 3 now supports transmitting network DMX protocols (Art-Net and sACN E1.31) through wired ethernet connections. 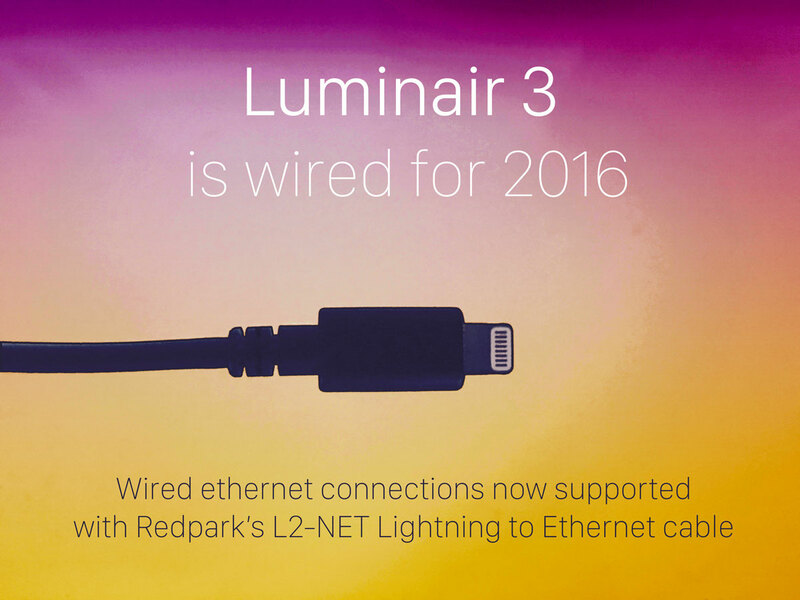 The newly released Luminair 3.1.1 update adds support for Redpark’s L2-NET Lightning to Ethernet cable. This Apple/MFi-certified cable converts the iOS lightning port into a standard ethernet cable, and will appeal to anyone who prefers a reliable and direct wired connection instead of Wi-Fi. 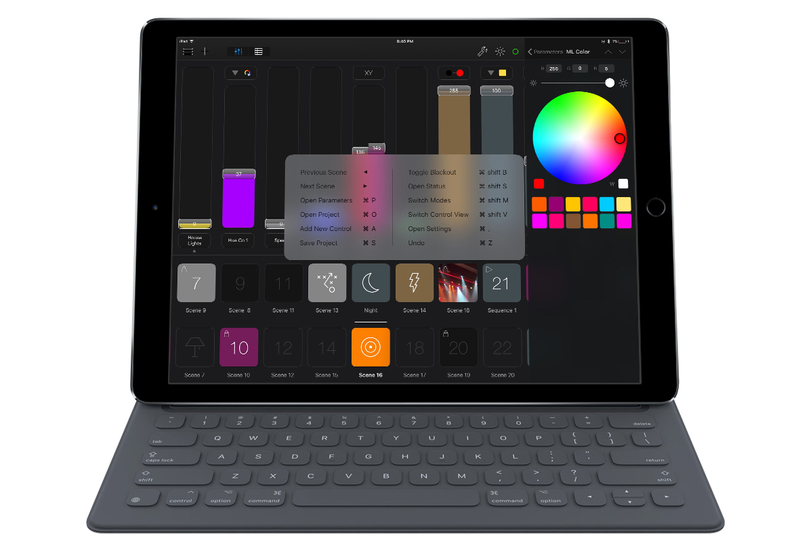 The new update also adds support for Apple’s iPad Pro Accessories, the Smart Keyboard and Apple Pencil. Keyboard shortcuts are now displayed contextually by holding the command (⌘) key on iPad Pro Smart keyboard and other bluetooth keyboards. Apple Pencil is now recognized when drawing custom movements in the XY position view on iPad Pro. Luminair 3.1.1 is available now from the iOS App Store. i have a problem where if i unplug the cable then i put my iPad air2 to charge, after a day or so i come back to church i plug in the cable and the app is open. the app does not recognize the cable, i tried to reopen the app unplug the cable and so much more still it does not work. if this is with the app please fix it, if its my side please tell me whats wrong. @Victor The first thing you should check is to make sure that iOS itself is detecting the cable when it’s connected. Open the “Settings” app on your iOS device. Select “General > About”. If the cable is properly detected, iOS will display it in the list. If you don’t see it listed there, try restarting your device and then open Luminair and attach the cable to your device. If you’re still having troubles at that point, please get in touch so we can try some additional troubleshooting steps. Using the Redpark cable, is there any possible way to power/charge the unit at the same time? One of our applications would REALLY benefit from this… We have one smaller room where we would like to install an iPad mini right into the wall as a dedicated unit to control the DMX led strip lighting in that room. Going directly to our enttech unit would be super cool, bypassing the wifi and router for a more solid connection. But from what I can tell on their site, powering/charging the iPad while their cable is plugged in, is not an option. @Jimmy It’s true that the L2-NET cable isn’t capable of powering the device. But there is a brand new accessory on it’s way later this spring, which we’ll be supporting in Luminair, that will offer both power and ethernet to the device. More info should be available about that product in the coming weeks, so stay tuned. 3, controlled Luminair by MIDI. Will be perfect for me. Nowadays I’m using ALESIS IODOCK II to charge and controll MIDI at the same time. But I’ve got some wifi troubles I’ll like to solve them using Luminair wired. Normally these problems are because of saturated wifi areas.